Use crow’s foot notations to illustrate the relationship between entities in a crow’s foot diagram. Entities are connected by lines, and symbols at either end describe the cardinality of the relationship between the entities. Because they are widely used and utilize only four symbols, crow’s foot notations can help you communicate complex relationships in an easy-to-use format. In Visio, on the File menu, click New > Software, and then click Crow’s Foot Database Notation. From the Crow’s Foot Database Notation stencil, drag an Entity shape onto the drawing page. 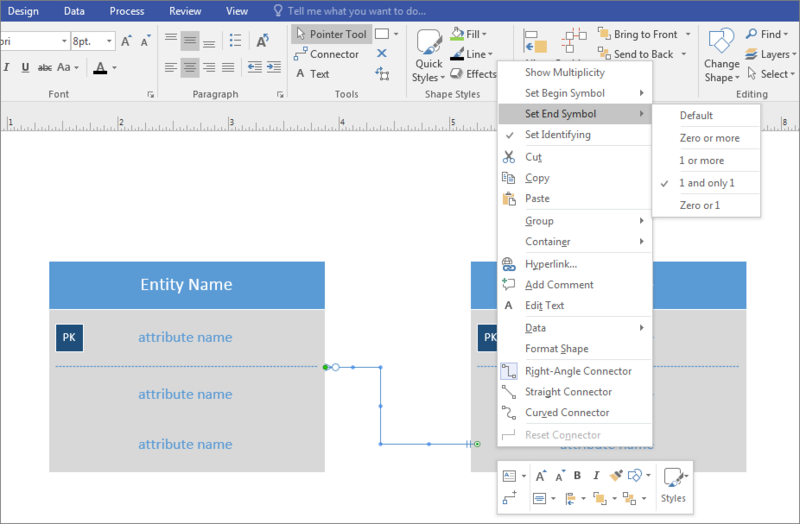 Drag another Entity shape onto the drawing page to create a second entity. Drag a Relationship shape onto the drawing page to create the relationship line. 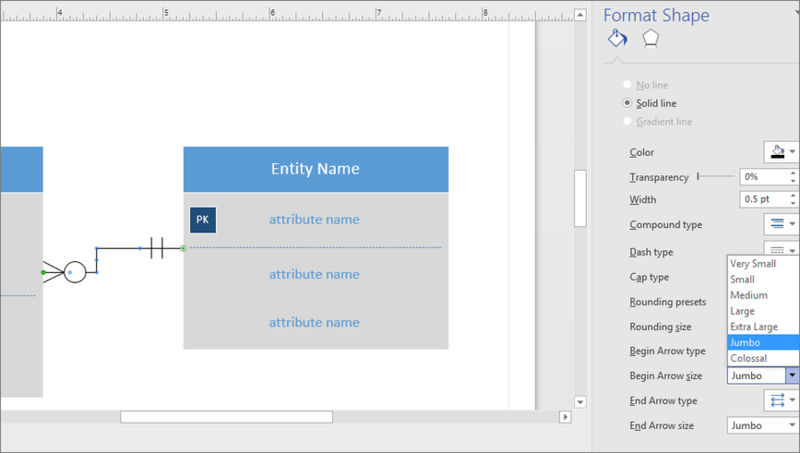 To connect the entities, drag the left end of the relationship line to the first entity, and glue it to an attribute, a connection point, or the entire entity. Drag the other end of the relationship line, and glue it to the second entity. Right-click the relationship line, click Set Begin Symbol, and choose from the list. The default is Zero or more. Right-click the relationship line again, click Set End Symbol, and choose from the list. The default is 1 and only 1. Right-click the relationship line, and click Format Shape. Click Line in the right pane to expand the list. To change the color of the relationship line, click the icon next to Color, and select a color. Click Begin Arrow size or End Arrow size to change the size of the Begin and End symbols. To add text, select the relationship line and type the text.